Washington, D.C. — From 2000 to 2015, the U.S. fell 7.3 million units short of meeting housing demand, according to new research from the Up for Growth National Coalition, ECONorthwest, and Holland Government Affairs. A new report, Housing Underproduction in the U.S., details the depth and breadth of the housing crisis by focusing on the 22 states and Washington, D.C., that failed to meet their historic housing production demand. 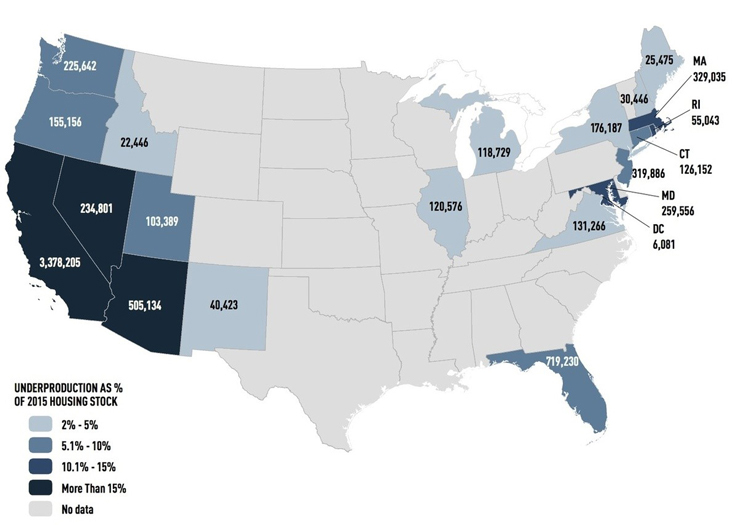 While California accounts for over 45 percent of the total shortage at nearly 3.4 million units, states in nearly every corner of the country underproduced housing, representing over 5 percent of total housing stock. In addition to increasing rents and home prices at an unsustainable level, failure to meet housing demand has other negative societal impacts, including suppressing national GDP, generating negative environmental impacts, and pushing individuals and families with limited incomes farther away from job centers. More of the same assigns new housing based on existing patterns that favor low-density, suburban sprawl. Intensifying urban density assigns additional housing units through a top down approach, filling in the densest existing block groups first to provide a comparative, if infeasible, baseline representing the extreme end of dense development. Smart growth would favor new housing based on a formula of existing density, distance to transit stops, and the share of commuters in a given area who drive their own vehicles to work. The research proved the significant benefits in the smart growth scenario. For example, using only 25 percent of the land required under the more of the same approach, smart growth could produce 7.3 million units by producing 10 percent single-family homes; 61 percent in middle-density housing such as townhomes, cottage clusters, and mid-rise buildings; and 29 percent in towers. More of the same would mean 54 percent of new units would be single-family homes alone, which require much more land and infrastructure installation and are often out-of-step with the lifestyle choices of younger Americans. Because housing is distributed more densely and closer to transit stations, smart growth could reduce vehicle miles traveled by 28 percent, if patterns produced in California hold for other underproducing states. Taking cars off the road improves quality of life and cuts CO2 emissions. Based on a dynamic, 20-year economic model, the report estimated that growth in a smart-growth approach would create an additional $400 billion in GDP relative to more of the same, or $2.1 trillion in cumulative GDP over the baseline forecast. The report estimates that smart growth would generate an additional $128 billion in federal income and payroll taxes over the same 20-year period. Local tax revenue, particularly property taxes, would also increase under smart growth. By Right Approval — Establish “by-right” high-density residential development in a half-mile radius around transit stations (roughly 5 percent of a metropolitan region’s land area). Impact Fee Recalibration — Recalibrate impact fees to reflect actual costs of infrastructure service for high-density development. Property Tax Abatement — Use property tax abatement as a gap-financing tool to enable more compact and affordable housing communities. Value Capture — Establish mechanisms to capture value created through up-zones and tax abatement investments to be used as dedicated funding for a range of housing programs. The technical advisory board for the report includes Harvard’s Chris Herbert, Ph.D.; George Washington University and Brookings Institution’s Christopher Leinberger; Peter Linneman, Ph.D., from the Wharton School at the University of Pennsylvania; Carol Galante at the University of California, Berkeley’s Terner Center for Housing Innovation; and Mark Obrinsky, Ph.D., the chief economist at the National Multifamily Housing Council in Washington, D.C.
Download a copy of the report at https://www.upforgrowth.org/research.